Highlighting brown hair with chemical dyes can be tricky. Commercial dyes can often leave brown hair orange and brassy, especially if you choose the wrong color for your hair or leave the dye on too long. Additionally, chemical dyes can leave your hair brittle and rough. Damage only adds to the brassy color, making proper hair care vital to using chemical dyes. Another way to highlight brown hair is to use natural substances. Apple cider vinegar, cinnamon and lemon juice are gentle and inexpensive, and they will leave natural-looking highlights. 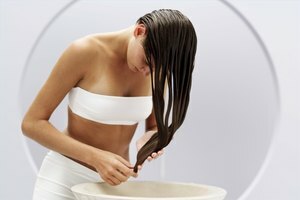 Mix about half a cup of lemon juice with half a cup of vinegar for very long hair. For medium to short hair, halve or quarter the recipe. Add enough ground cinnamon to form a thin paste. The lemon juice will bring out natural blond highlights, while the vinegar and cinnamon will bring out reds and browns. Wash and condition your hair as normal and towel dry it very lightly. Scoop up a small amount of the paste and apply it to the roots of your hair near your hair line. Work more paste into the rest of your roots, then smear paste evenly through the rest of your hair. Coil your hair into a loose bun and tuck it under a shower cap. Let the paste set for four to eight hours, sleeping with the shower cap on if that is comfortable. Remove the shower cap and carefully comb through your hair to remove most of the dried paste. Remove the rest of the paste with warm water, dampening your hair thoroughly. Apply a leave-in conditioner from the ends of your hair to the roots for extra shine and to help subdue any residual vinegar smell. Dry your hair as usual. If the highlights are not as bright as you like, reapply paste each week until you get the desired color. Choose the right dye for your hair. Study the color charts on the back of the dye kits. There should be several "before" shades. Look at the one that most closely matches your hair and follow the color blocks across to the "after" shade. Choose a dye that is only a shade or two lighter than your hair. For example, don't pick platinum blond if your hair is mahogany. Mix colors. If you find a red or blonde dye you love, but your hair is very dark, purchase a brown hair dye as well. Mix as much dye as you need, using equal parts of the lighter color and the brown. 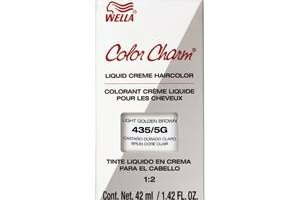 This ensures that the highlights will more closely match your hair color, eliminating high contrast and brassy colors. Do not let the dye sit on your hair for longer than the box instructions advise. Some dyes turn your hair different colors depending on how long you let them sit; choose the shortest amount of time, especially for lighter blonde and red dyes. If the dye is almost bleach-blonde or coppery red, you may want to remove it a minute or two early. Condition your hair. Most dye kits come with a super-saturated conditioner. Use it right after you rinse the dye out, working generous amounts through your hair. Let the conditioner sit for about five minutes before rinsing it away with warm water. Comb your hair out gently and apply a leave-in conditioner. This reduces damage and dull, brassy highlights. Natural ingredients will lighten the highlights already present in your hair, eliminating guesswork. They will lighten all of your hair, but since your highlights are naturally lighter, the lemon juice, vinegar and cinnamon will make them more noticeable. Any dryness from the lemon juice should be counteracted by the vinegar and a leave-in conditioner.